I fell in love with Canopy in Athens, Georgia when I first visited at the start of 2015, so I’m delighted to be returning there September 19 and 20 to offer workshops and private lessons! 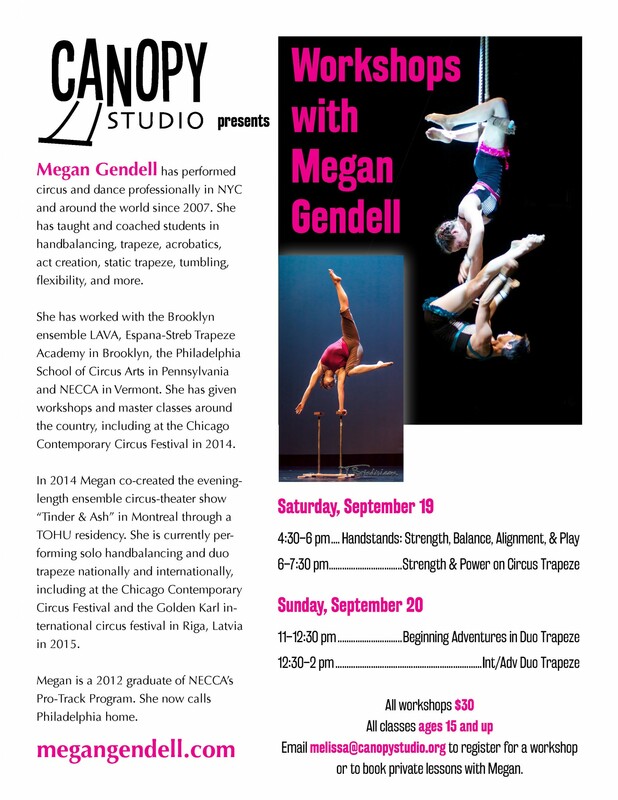 Here are the offerings; email melissa@canopystudio.org to register for a workshop or to book a private lesson with me (static trapeze, duo trapeze, handstands/handbalancing, flexibility, partner acrobatics, tumbling, or act development!). Enjoy life upside down as you build a consistent handstand. Learn proper technique and drills you can practice alone and with a partner, working toward holding a solid handstand in the center of the room. Emphasis on core stability, shoulder flexibility, and injury prevention will contribute to handstand practice that is safe, productive, and FUN. For students with some circus/aerial/acrobatic experience. Want to get stronger on trapeze, but not sure what to do? We’ll work through conditioning exercises that you can do in a variety of settings (with a buddy or solo; on a trapeze, at a gym, or on a home pull-up bar) to build the strength you need to move around the trapeze with ease and unlock the next level of skills. Then, we’ll explore how to maximize your power and momentum by refining knee hang beats, ankle hang beats, and hand beats, then transferring the loft they create into easier, more fluid movements and dynamic tricks. For students capable of a 15-second front balance, ankle hangs, and inverting in the ropes. In this introduction to duo trapeze, we’ll explore sharing the trapeze with a partner, safely supporting someone else’s weight, and moving in relation to another body in the air. Students will learn basic duo trapeze skills, as well as technique for basing and flying. We’ll also spend time inventing unique weight-sharing positions and creating exciting shapes with two bodies on one trapeze. For students with comfort moving solo around the trapeze and capable of a 10-second front balance, ankle hang, and inverting in the ropes. Learn or refine dynamic duo trapeze moves and transitions, including beats, elevators/swan-ups, and beginning release moves. For students with experience sharing the trapeze with a partner.